Do you want to make and sell items from this pattern? Commercial licenses are available! Here’s one more vacation/travel themed page! This page was about 3 weeks in the making due to two weeks of me being quite sick. It was all I could do to make it through each day taking care of Jax and doing as much work for my day job as possible. I still came out 12 hours short in work hours, ugh. Not that I’m well, I knocked the rest of the page out and I’m ready to move on! What I used: the pattern, felt (in light blue, dark gray, white, natural, brick red, aqua, yellow, blue, red, gray and scraps), thin blue ribbon, thin gray or tan ribbon, decorative ribbon, snaps or Velcro and matching thread. 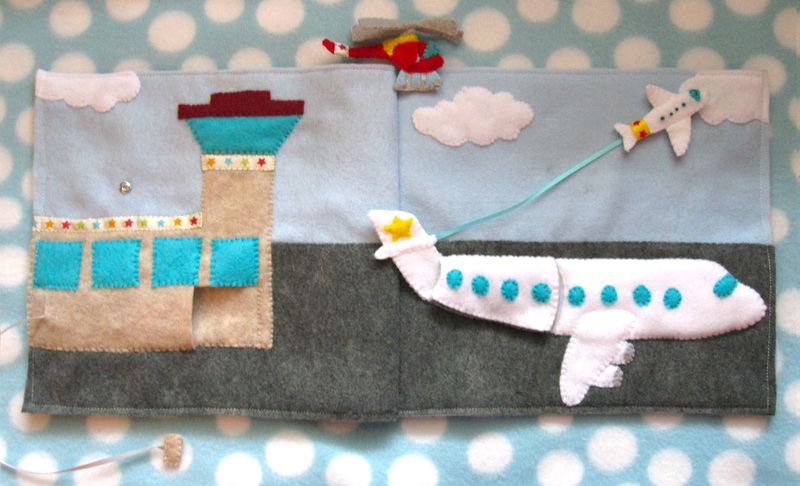 Background: Sew the windows on to the front of the airport. Cut out the door and a small slit for a ribbon to come through on the left side. Thread a length of ribbon through the slit, coming out of the door for the truck. Pin down your ground and airport pieces. 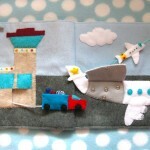 You will need to layer a scrap block of felt behind the door of the airport. Sew down the airport building, leaving the door open. 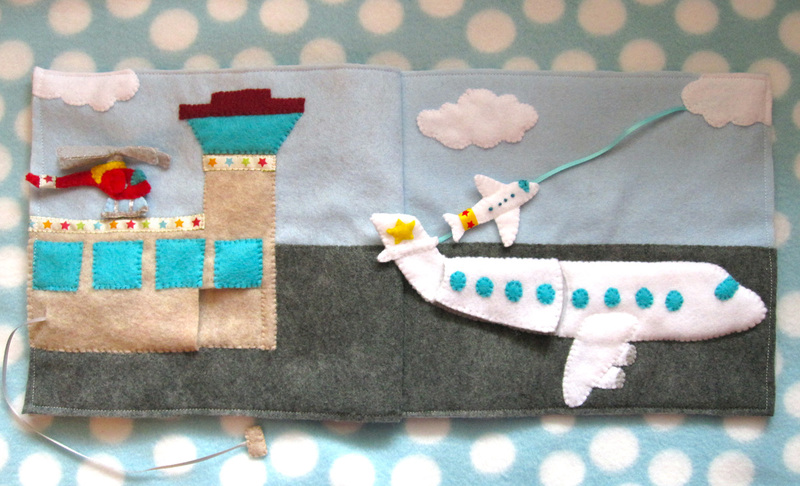 Sew the air traffic control window and roof on and add decorative ribbon if you’d like. 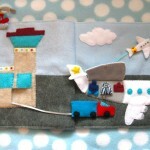 (You could add photos of loved ones to the tower and windows of the airport and sew clear vinyl over top.) 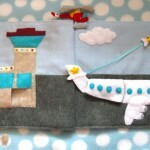 Pin and sew clouds to the sky. I caught one end of my blue “small plane” ribbon under the cloud in the upper right corner and the other end under edge of the ground. Sew down the ground. 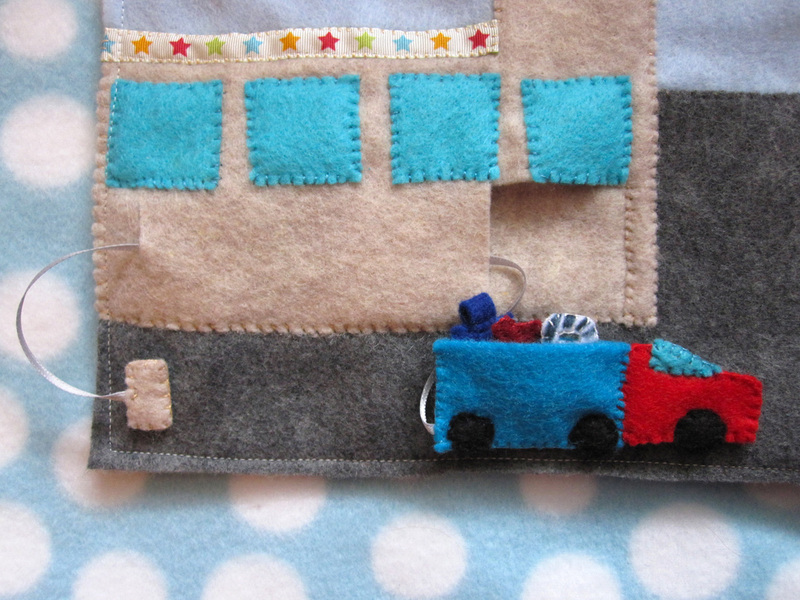 Baggage Truck: Pin the truck bed and cab pieces onto the end of the ribbon. Sew the sides and bottom of the bed (making a pocket for luggage) and all the way around the cab. Add the wind shield and wheels. 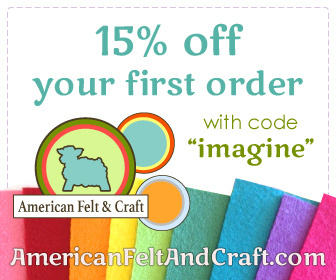 Sew a folded scrap rectangle of felt to the left end of the ribbon to keep it from going through the slit. 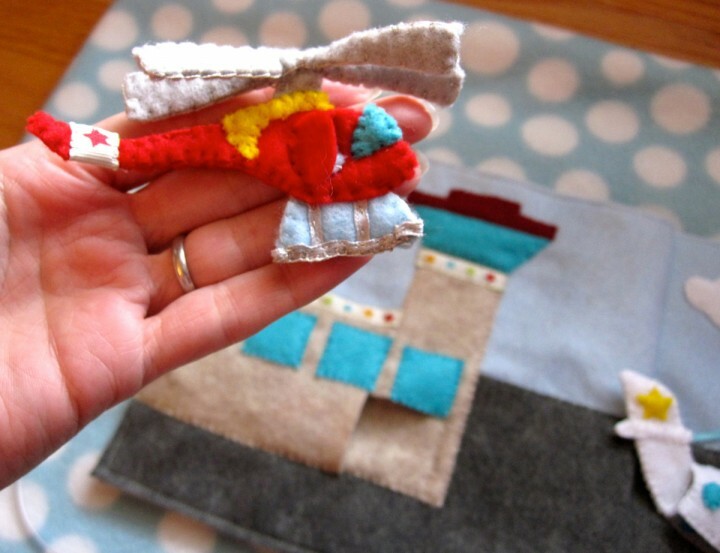 Small Airplane: Make 4 French knot windows on the top small plane piece. Sew the wind shield pieces on each side. 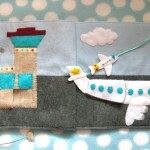 Sew the two plane pieces together. Decorate the plane’s tail by sewing some decorative ribbon around it. 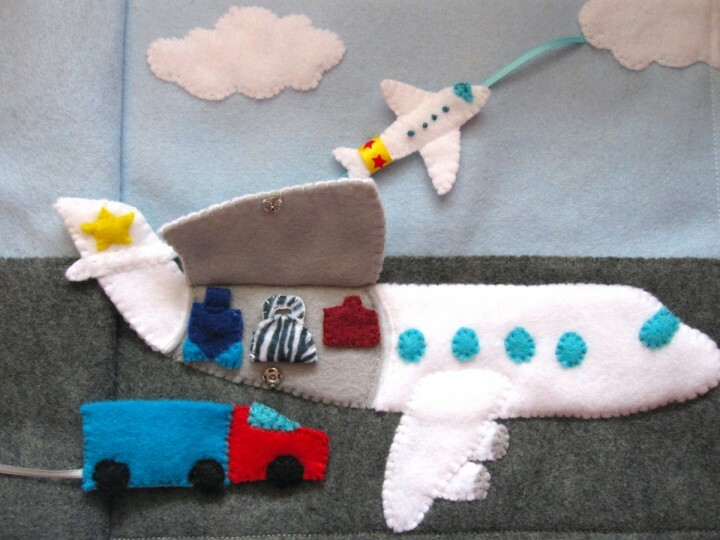 Take a scrap square of white felt and sew the top and bottom of it to the back of the plane with the blue ribbon running through it. Your stitches will make the accent lines across the base of the wings. Your small plane should then “fly” up and down the ribbon. Large Airplane: (Because the airplane was wider than my 9″ pages, I had the airplane’s tail sticking off the page so it can fold over when the page closes. My instructions assume you do the same.) 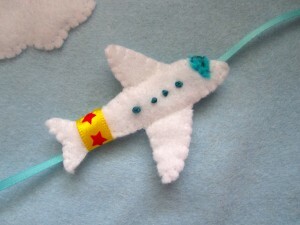 Pin the base airplane piece down to the page, leaving the tail unpinned. Cut the top airplane piece into 3 segments. Sew stars to the two tail side, then sew the tail together. Add the tail fins. Sew windows and wind shield to the front two airplane segments. Pin down and sew the engines, wing and front airplane segment. 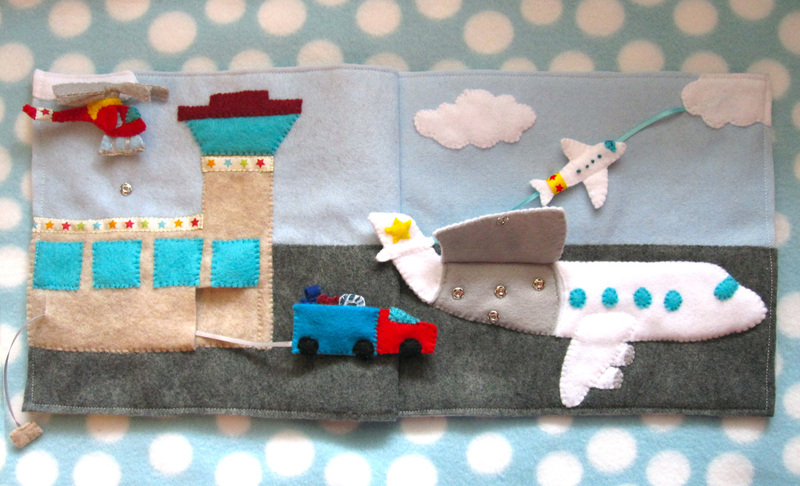 Sew the bottom half of the gray cargo hold piece to the page in the middle segment of the airplane. Fold down the rest of the cargo hold piece and sew the middle segment of the top airplane to it to make a flap that lifts to show the baggage. Sew a snap on to hold the flap closed, and add snaps to secure any bags you make. Helicopter: Sew the two blade pieces together. Fold the “x” in half where indicated on the pattern and make a few stitches int he center to hold it down. 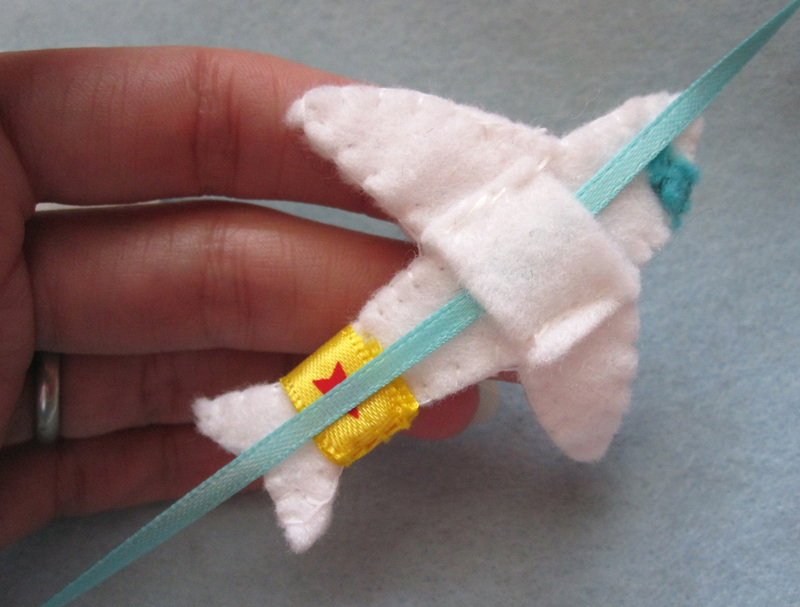 Sew thin ribbon down to both sides of the landing gear background pieces as indicated on the pattern. Sew the two sides together. 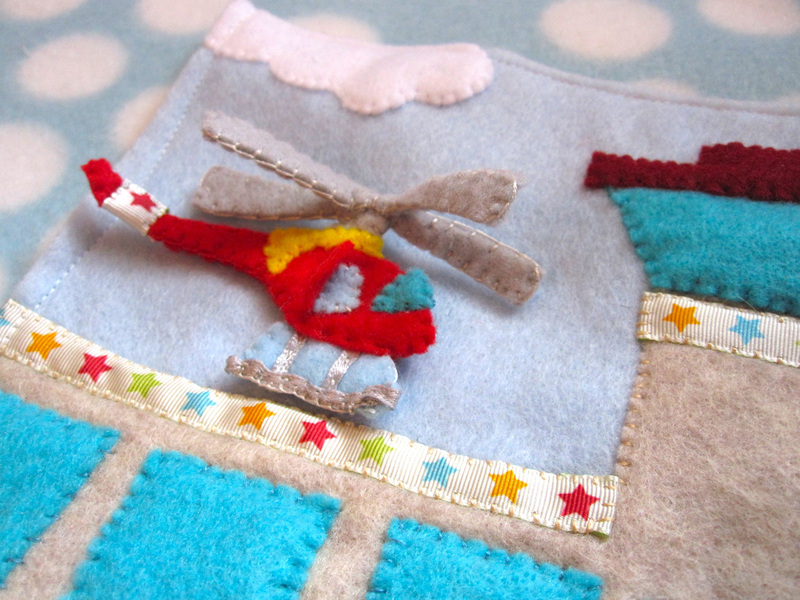 On the front piece of the helicopter, sew down the wind shield, accent piece and inner door piece. Sew down the door along one side so it opens. On the back piece of the helicopter, sew down the wind shield, accent piece and a snap. Sew the front and back together with the blades and landing gear in place. Sew the other half of the snap to the page above the roof. 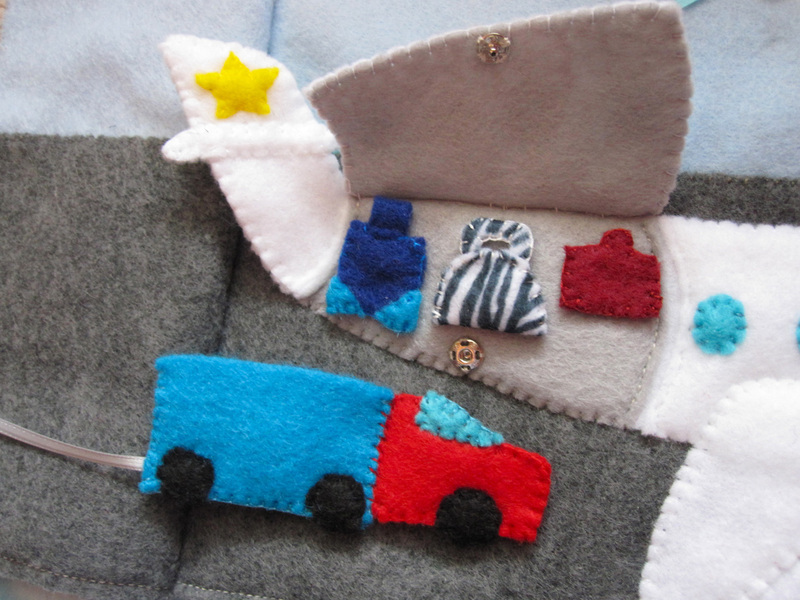 Luggage: I didn’t use patterns for my luggage because they are so tiny! I did draw up what I made afterwards, so you can use those as a guide if you’d like. They just need to fit in the cargo hold (and truck bed) and have snaps to attach them. Jax hasn’t really played with this yet because it is for our beach trip, but he loves the little helicopter and the small plane that takes off. I think he’s going to enjoy it! This entry was posted in Crafts, Quiet Book, Sewing and tagged Crafts, Free, Patterns, Quiet Book, Sewing on April 14, 2012 by Stephanie. Thanks for posting this! You are so talented! THAT COULD NOT BE ANY MORE PERFECT OR CUTE!!!! I absolutely love this quiet book!!! I would love to make (or buy if you sell 😉 😉 )do you use a sewing machine or by hand as well where would you reccomend someone new to this starting? Any guidance would be appreciated. I do mostly hand-stitching, but use a machine to sew the backings on. I’d say, pick a page you really love to start on! It is good motivation to tak eyour time and really create something lovely. Good luck! Thank you so much for providing templates! I am working on my 3rd page of your designs, this airport. Wanted to pass along this: I’ve been using cheap synthetic felt but have found it to be weak in stressed areas (of course). I’ve experimented with putting some fray stop on areas that I know will get a lot of wear and it has worked like a charm. I don’t at the moment… They take SO long to hand sew! Amazing! I love this! Awesome quiet books! Just finished one (bed/bath) page from the dollhouse for my daughter, I’m on a roll and loving it! The patterns, pictures and precise explanations make it so easy. 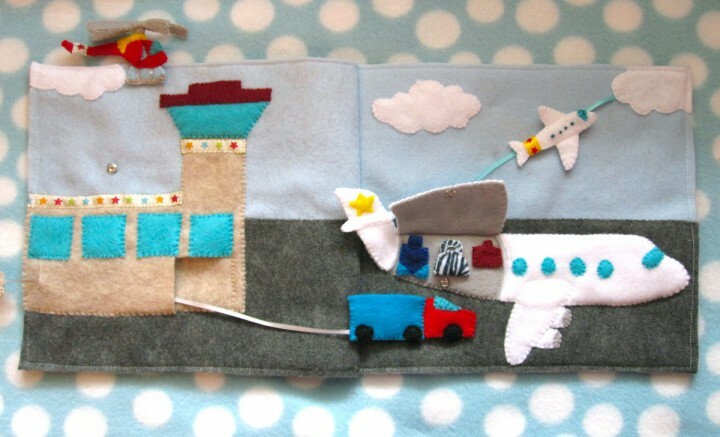 I am so impressed with my work I’m going to start this (airport) page for my son before I start the kitchen for the doll house. 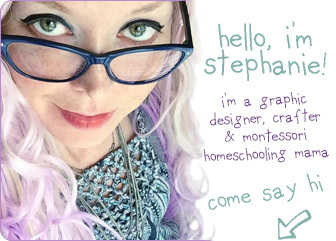 Thank you, thank you so much Stephanie, I have found my new ‘spilt milk’ stress relief remedy!!! I was wondering If I am making a quiet book for afriend and she is paying a lump sum for the whole book do I need the license to use some of your patterns.? Also how much would you charge a friend? Stephanie I’ve seen, used and played with many ‘a quiet book in my time and yours are by far the most creative, intricate and well made ones I’ve ever seen. Since opening my very own Quiet Book some 50 years ago I’ve been fascinated and in love with them ever since. I’d intended on making them for my own children, but health issues prevented that. Now I have my first grandbaby and after pulling out my old Quiet Book, I’ve been gathering ideas for his! You’ve given me far more ideas than the standard zipper, button, counting and colors book! You are incredibly creative and most definitely will be successful in your venture to be paid for your patterns and ideas. Although i certainly appreciate that you’ve offered them for free! I couldn’t have afforded them otherwise. I also believe if you had the time, the finished books would fly out of your creative space super fast! You’re so skilled that the books are truly a work of art. God bless and may you be successful in finding balance between work and home! Thank you for your sweet note! I will still be making more free patterns. I know how the cost can add up! I have tried down loading your patterns and they are very small to print. There are 4 of them that I would like to print but cannot.